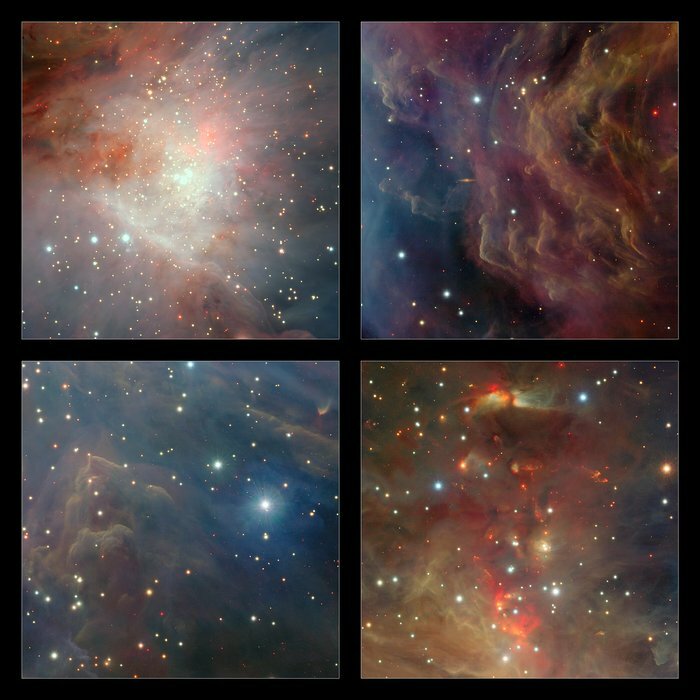 On the upper-left, the central region of VISTA’s view of the Orion Nebula is shown, centred on the four dazzling stars of the Trapezium. A rich cluster of young stars can be seen here that is invisible in normal, visible light images. 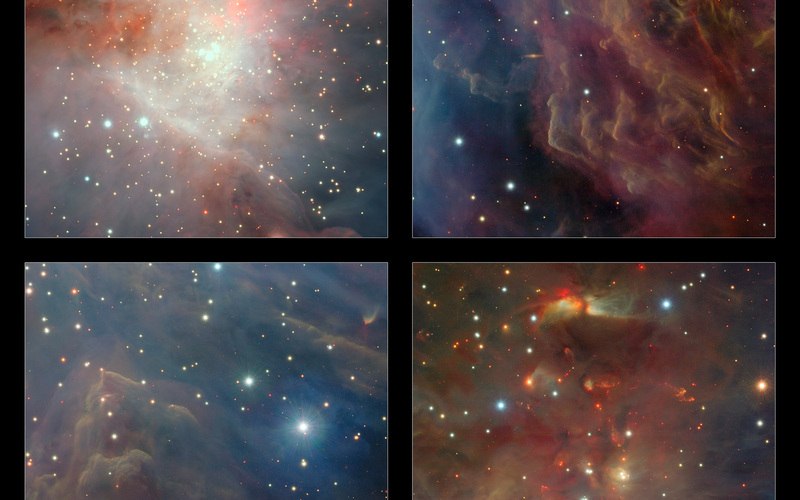 In the lower-right panel the part of the nebula to the north of the centre is shown. Here there are many young stars embedded in the dust clouds that are only apparent because their infrared glow can penetrate the dust and be detected by the VISTA camera. 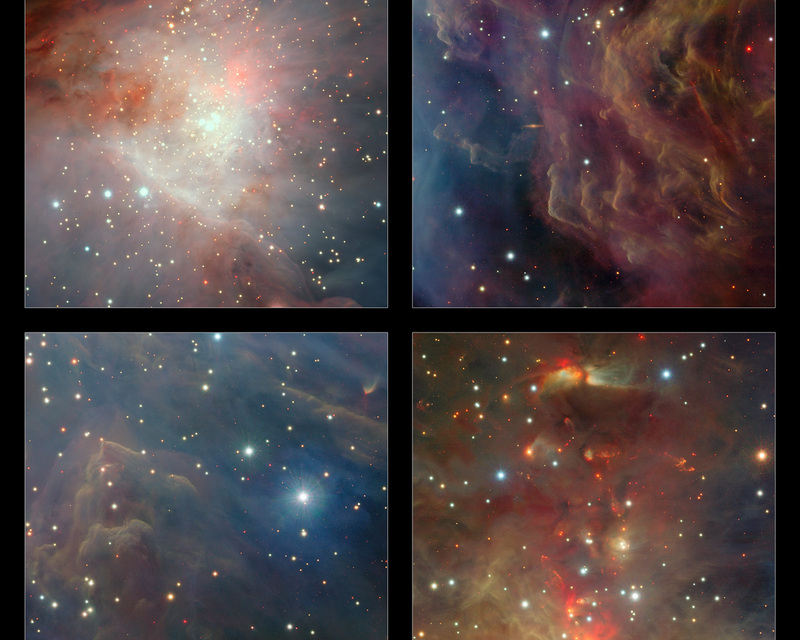 Many outflows, jets and other interactions from young stars are apparent, seen in the infrared glow from molecular hydrogen and showing up as red blobs. On the upper-right, a region to the west of centre is shown. Here the fierce ultraviolet light from the Trapezium is sculpting the gas clouds into curious wavy shapes. A distant edge-on spiral galaxy is also seen shining right through the nebula. At the lower-left a region south of the centre is shown. Each extract covers a region of sky about nine arcminutes across.